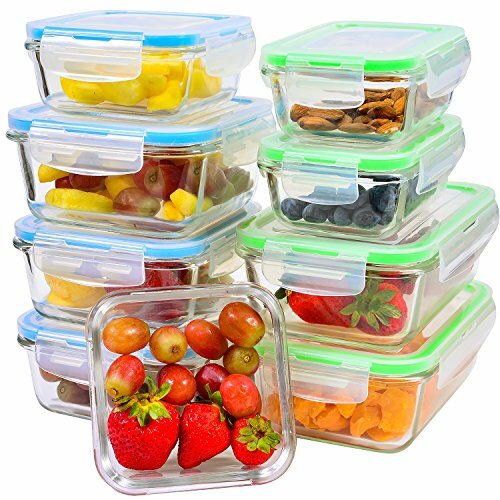 Get these high-quality Glass Food Storage Set and start serving fresh and healthy food to your family. Elacra, maker of high quality kitchen and baby products, is proud to offer you its its 9-piece Oven Safe Glass food storage containers. These premium quality glass food storage bins are oven, microwave, freezer, and dishwasher safe. Each glass lunch box container features a 4-point air tight locking mechanism that allows you to store leftovers, snacks, pre-made meals, and even soups and liquids safely in your refrigerator or freezer without the risk of spills or leaks. Keep your family's food safe and fresh and prepare healthy meals ahead of time for prep and serving in seconds. Ideal for both fresh and dry foods, our food containers are perfect for boxed lunches for school, work, or play. Microwave safe storage containers are guaranteed not to warp or bubble even after years of use. Use time and time again for years of fresh food enjoyment. Durable glass containers are made to last and won't crack or flake like other low-quality store brands. Use time and time again for years of fresh food enjoyment. Stop wasting money throwing out spoiled or poorly packaged foods and make the switch to the highest quality solution to your food storage needs. 28.4 oz x 2, 23.3 oz x 1, 19.2 oz x 2, 11.4 oz x 2 and 11.2 oz x 2. Click add to cart at no risk and start enjoying safer, fresher food for you and your family. SIMPLIFY YOUR BUSY LIFE: Heat-resistant borosilicate glass won't crack or break like tempered glass, making it easy for you to go from the oven, the microwave, and the freezer to the table (except lids) - then right into the dishwasher! HAPPIER & HEALTHIER: 9 BPA-free rectangular and square containers made from high-quality glass that keeps your food safe from mold, bacteria, and chemicals. Perfect for travel, baby, work, and school lunches. KEEP TASTE IN, ODORS OUT: Airtight containers and leak-proof lids with silicone seals on these meal prep containers keep your food fresher, longer. EASY FOR YOU TO OPEN & CLOSE: 4-sided locking lids make opening and closing meal prep containers a snap for everyone in the family. Perfect salad and snack containers for women, men, and kids. SIZES FOR EVERY NEED: The glass container set of 9 helps you customize and organize your on-the-go life. Portable sizes designed specifically for lunch, picnic, school, sports, meals and snacks. If you have any questions about this product by Elacra, contact us by completing and submitting the form below. If you are looking for a specif part number, please include it with your message.